Alberto Ledesma is the author of the upcoming book Diary of a Reluctant Dreamer, which comes out in September later this year. He is currently the Graduate Diversity Director for the Arts and Humanities at UC Berkeley, and works to assist underrepresented students make their way towards a postgraduate education. In his new book, Ledesma discusses his early life as an undocumented child living in Oakland and his personal struggles and accomplishments as a college student and a professor. I had the opportunity to speak with Alberto Ledesma about his work and personal life. The following is an excerpt of our conversation. What made you want to write an autobiography with a heavy reliance on illustrations? It is a pretty unique memoir. 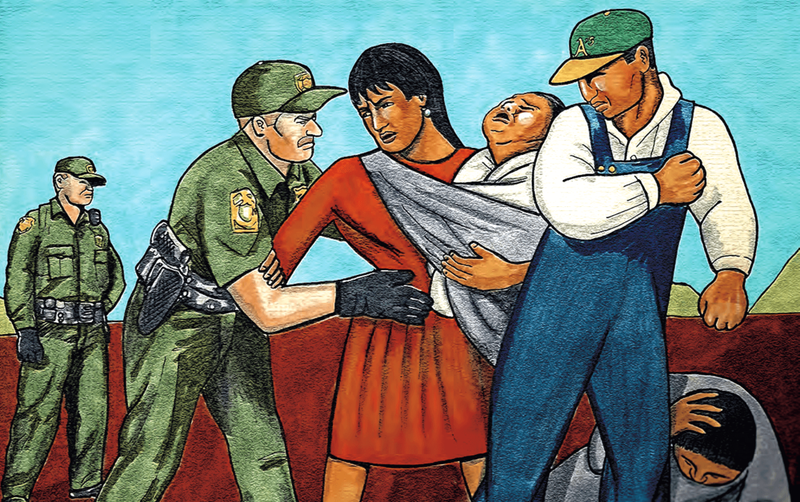 I’ve been trying to initiate a conversation about what being undocumented means, more in a philosophical and analytical way, into understanding the social and psychological impact of the experience of being undocumented. But doing it via the academic track has a lot to do with timing. It seemed that dialogue wasn’t really gaining as much traction as I wanted it to, and eventually I discovered that people have quicker access to some of the questions and issues that I was explaining through illustration. So I started doing illustrations and thought that the audience was academics but in reality it was people that had gone through the same experiences I had. And for them, the cartoons are more immediate, they’re more digestible. They’re able to look at them and immediately know that’s what they’ve lived through. It was a skill that I had and neglected, and I didn’t know that it was going to be critical for my intellectual growth. But now, this is what I do, and I had primarily been doing it through Facebook, sharing a lot of these images. When Frederick Aldama saw my work, and created the new series he has, Latinographix, he suggested I put a book proposal together, and I did, and, lo and behold, there it goes. What got you into illustration? I think I had that instinct since I was a little kid; I was always doodling. I remember in Mexico, when I was growing up, my mom had all kinds of comic books laying around. When you’re a little kid, if you haven’t learned to read yet, comic books are accessible, because you want to know what’s happening in the text, and you can decipher the images. For me it became my entry into literature. There was a series called “Caras y Lagrimas,” and it was this heavy melodramatic story, and I was always fascinated by them. When I came to the US as a little kid to Oakland, and was undocumented, again I didn’t know how to read English, but comic books were an entry point into the language because I could always see. If I got a Spider-Man comic I could figure out, just based on the action of the characters, what was happening in the story, and that’s how I began to learn English. When you’re into comic books as much as I was, you want to do them. And when you start doing them, you get into art, and so maybe in about the fourth or fifth grade I remember wanting to do my own drawings in my own comic books. Which superhero do you identify with the most? The character that I identify with the most is a complicated character, one whose politics are not necessarily the same as mine, but I think Cantinflas is a character, socially, that for me has a lot of relevance just because of the relationship to language. In comics, comic book heroes are characters that have a way of making a difference, of asserting themselves physically and making a difference relative to social injustice. And although I romanticize being able to do that, I knew, especially when I was younger, that I couldn’t do that because of my own legal instability. And so I wanted it cause I didn’t have it I think that I came to identify with some of the characters that seemed to be less powered, like Spider-Man, who resonated with me because he was kind of a wimpy kid who by accident gained his power. Once he did, that’s when he became foreign to me. In your book, you discuss the discomfort of bringing up the topic of your childhood as an undocumented immigrant and the need to suppress talking about it. What made you work up the courage to finally speak out? Part of it was the national politics. I’ve been focusing on this subject for so long that the national politics caught up to my concern. In graduate school, this is what I wrote about. This is the literature I studied, I’ve lectured about this long before the undocumented student movement exploded, but once it did, I found that I had something to say about it. For me, early on before the movement, I felt that I had to be careful with the way that I invoked the experience of being undocumented, particularly because of my family. My father had specifically trained us to be very careful, be very strategic as to whom you share that experience. And for me, I didn’t realize just how imbedded in my mind that kind of emanation had become. It wasn’t until the undocumented movement emerged that I started writing about things and that I realized I was also exercising, in all of these lessons, all of the warnings that my parents had given me. One of the first essays I wrote on the subject was on embracing my undocumented identity, which I include in the book. I would say about half a year later the undocumented movement exploded, and I realized that it wasn’t just me, it was a lot of people who were feeling a similar way nationally. So, I’ve come to terms with that identity a lot more. Even after you normalize the status, it doesn’t mean you’ve normalized the taboo and the anxieties you feel about having been undocumented, which is always with you. But I learned how to incorporate them and how to see them apart of now my identity as a new American. This is part of an identity that I don’t want to forget, and I think that socially, the pressure is for us to forget that we even went through the process of coming to terms with it. What similarities and differences do you notice in the social reform before the introduction of the Dream Act and now with the current White House administration? I think that issues and concerns around the undocumented population in the United States have been with us since after the IRCA (Immigration Reform and Control Act), and a lot of it of course has to do with the economy. For the last several decades, we’ve had an economic downturn in the United States, most obviously in terms of how it’s manufacturing base has been transitioning towards a more service-oriented base. I think, because of that, a lot of disposable pools of labor brought to the US to help with labor and manufacturing, and this is backed up by a lot of research, are being criminalized, which most prominently affects those undocumented people that were encouraged to cross the border by previous economic regimes. We’ve been in an identity crisis, for many decades now, with this immigrant community and immigrant identity, and one of the things that we’ve seen are growing tensions around how the immigrant community has been racialized as non-white and how, in the US, folks who feel that they’re losing their white privilege are the ones who are exercising and creating a political moment to try to reassert that privilege. We’ve seen this over the decades; it happened in the early 1900s, it’s happening again; we go through cycles of this. For me, when I look at it, what I hope is that the turn comes so that it doesn’t become as bad as when the repeals happened in the 1930s. I really think that the repeals of the 30s led to a period where racial identity was criminalized. I think that there’s a part of us going in that direction, but we’re really at a fork in the road. My sense is that what the Trump administration represents is either the beginning of a new kind of racist regime or the end of a racist regime, and I hope it’s the latter. After living a childhood as an undocumented immigrant and later becoming a citizen, in today’s political culture, what do would you want to say to politicians in Washington wanting to deport immigrants? I think that there’s too much emphasis on an oppositional debate where there’s this assumption that when we’re arguing against immigrants, it is the native born American arguing against the immigrant. What I would want to invoke is that there’s a continuity; that to argue against immigrants is also to argue against Americans. I’m an example of an immigrant who’s now an American, and I’m not the only one. There are millions of us who have gone through that experience. To take an identity and vilify it or stereotype it really is an affront to the American people, and what I would ask for is not necessarily agreement, but understanding. To better understand historically and sociologically what the experience of being undocumented or migration in general means, and where it came from, and what the possibilities are for the future. To say that you can’t even name it, you can’t even make an assertion for rights, though you’ve come from this background, it really ignores the basis of what this country stands for. For me, my work is inspired by that injustice. Even if you’re arguing against undocumented immigrants, workers right now here in the US right now, parents, their siblings, their children, people who are citizens of this country too, there’s an organic relationship in the community there that needs to be acknowledged. I think that we’re also at a point in our history where race has been commodified; racism has been commodified, in a way where it’s been exploited for political benefit. That’s a cynical thing that has happened, and it takes off, and because it takes off we see exactly how when there’s a base of people whose racial fear is weaponized as an electoral tool. I think that as long as you have that strategy, there’s not going to be vessel to have a better understanding between the communities. That’s what motivates my work. My work is not about trying to vilify people in power or a whole class of decision makers, my work is about trying to humanize those of us who have gone through this experience in a way that there can be a better understanding. In your book, you also mention the reluctance of some writers’ to feature immigrants as central characters in literature. Where do you think the issue came from early on? That’s always been, in communities where part of the community might be an immigrant community, certainly in the Mexican-American community and the Mexican immigrant community, there’s always been a tension between the recently arrived members and those who’ve been where they are for generations. Often we’re competing for the same jobs, we’re affected by the same racism, and our loyalty is always in question, so there’s a natural tension that has emerged there. If you look at the ways the representation of undocumented experience happened early on, they tended to reflect that interpersonal or intercultural dynamic in which immigrants weren’t the heroes but more people in the background, because most of the early writers tended to be folks who were second, third, or fourth generation. Immigrants weren’t protagonists; they were often either secondary characters or antagonists. Of course, that’s not a rule, but it is a tendency in some books. An exception that comes to mind is Tomás Rivera who did a good job creating an example of a more complex sense of community and characters. It’s not surprising, I think what you see happening is that recently a better mapping or a better understanding of a more complicated community, one where there’s more diversity in terms of citizenship, political perspective, gender identity, is emerging, and so there’re a lot of possibilities. What advice would you give to current undocumented immigrants or first-generation students wanting to pursue a higher education? First of all, to not lose faith in their own ambition, their own dreams, and their own ability to work towards that dream. I think that they have to be persistent, and that nobody gives you anything without struggle. I think that’s where we’re at right now. A lot of the civil rights issues that were fought for are basically at point zero again, and we’re in a situation where we have to begin another effort similar to prior generations in order to try to generate and transcend the kind of racism that exists right now. So, that would be one thing that I would recommend, you know if you feel frustrated don’t just feel it, go do something about it, write an op-ed, or go volunteer at a community organization that is working against some of the anti-immigrant policies, but do something, don’t just be reactive. 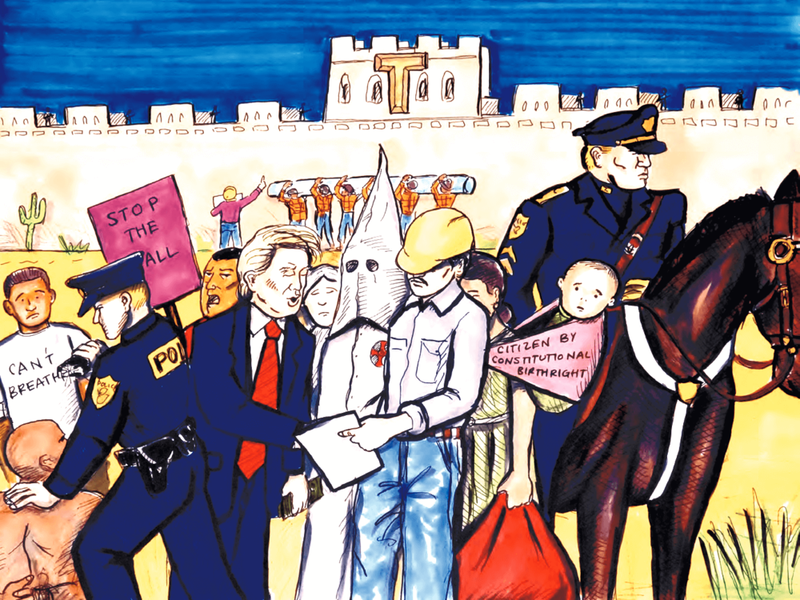 Some of the very racist policies that are aimed at immigrants are an attempt to silence and mute the emerging political forces of this community. And one example that you’ve seen is in California where I live. About 20 years ago, we had a Pete Wilson who lead the fight relative to Proposition 187 that wanted to deny educational access to undocumented immigrants and their children and what we saw from that was the radicalization of the community- not just undocumented immigrants who were targeted but also the family. And now if you look at the legislature and the policies that are coming down were probably the most immigrant-friendly state in the country. And that’s not an accident, that’s because the community didn’t stand still, the community reacted and became very active in politics. My sense is that’s what needs to happen. The challenge though is the things that are coming out of Washington are seeking to invalidate and suppress the vote of this community. We have to be diligent and we have to check and make sure that doesn’t happen. What advice would you give to undocumented immigrants wanting to speak out in today’s political protests without fear? There are certain members of the community who have the agency to protest and they are protected by their reality as citizens and therefore they’re exercising their rights. We’ve seen this in the past. With immigrant folks who are still subject or are the target of the attack, what I recommend is there are other ways to resist. Churches often do offer a place to organize, being able to communicate with community leaders about what are the real experiences in being able to tell authentic stories about that experience becomes important. Other things that can be done is not to give in. I think that one of the big pressures coming is not to even talk about or acknowledge being undocumented, and that’s a survival mechanism that is very well understood. But I think what has a lot of impact is particularly with children. If you’re a family and you have kids, then you’re being targeted for this. What happens is that in order to protect your kids, you don’t talk about this experience. But I feel that that’s a mistake. What needs to happen is, first of all, you need to get as educated as you can get about the real history of all these issues and let your kids know what is happening right now is not new and is part of something that we’ve been before therefore the solutions to resisting are not new and there are things that we can do. For kids, certainly an education is the thing to focus on, but for parents continuing to support each other in a private way working internally in communities that this is something that can be done, that has been done in the past. A lot of non-profits emerged during the early stages of the civil right movement and they became the models for activism precisely because of these issues and the government, who’s targeting them. Alberto Ledesma’s ‘Diary of a Reluctant Dreamer’ will be available on September 22 from Ohio State Press and is also available for pre-order.